Responding to the story, Streetsblog dug a little deeper into last year’s budget deal (the same one where the state basically abandoned its commitment to help pay for free student MetroCards) to illustrate what state politicians did: They raided funds from certain tax revenues that, by law, are supposed to go to transit in New York City and its suburbs. By the way, voting in favor of what Streetsblog calls “picking money from straphangers’ pockets” has not stopped state politicians from blasting the MTA for its plans to cut service. The Daily News has written a series of editorials (see part 1, part 2, and part 3) identifying those legislators who showed up at this month’s public hearings to complain about service cuts they helped create. 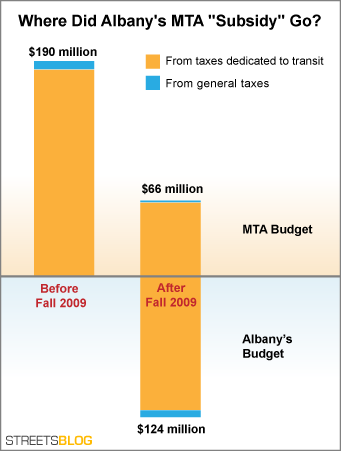 If transit fares do go up this year, riders might want to send the bill to Albany.